Today, In this post we are going to implement YouTube like ajax progress bar using jquery. if you are the user of YouTube, then you may have been seen YouTube red color progress bar which appears on top of a YouTube page while loading page and also you may have been this feature in some other website as well. 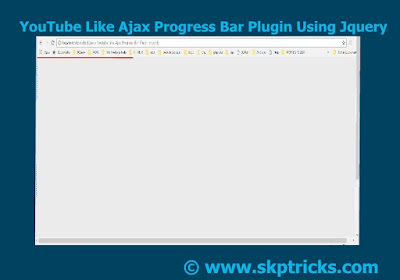 I have found YouTube like ajax progress bar jquery plugin in below website. So here we are going to use same plugin for our demo and we have tried our best to make this demo as simple as possible. Hope this example helpful for you. Lets follow the below steps to display YouTube like ajax progress bar on top of the page. Call the below jquery function to display ajax progress bar on top of the page. Display the data on complete page load in below container. Now you are done with configuration part.Basically This plugin display the ajax progress bar, when you are trying to load page using ajax call. This page consists of jquery library file, ajax progress bar css and jquery file. We are going to load below page using ajax progress bar plugin. This is all about YouTube like ajax progress bar loading animation effect using jquery. Thank you for reading this article, and if you have any problem, have a another better useful solution about this article, please write message in the comment section. We are loading ajax.html file using Jquery load function. Please check below we have created ajax.html file, that we are trying to load with ajax call.